PrivatQ is a on-the-go private education service provider platform that can be accessed anywhere and anytime. Using the PrivatQ smartphone application, students can find tents that suit their learning needs and character. Tentor is ready to come to the location within the agreed time to assist each student's learning activities. PrivatQ is one of the education start up in Indonesia. PrivatQ founders are Ikhwan Catur Rahmawan and Asep Suryana. Since 2017, they try to provide educational solutions through PrivatQ which are expected to make it easier for users to access educational services to improve the quality of education. PrivatQ is made to make it easier for users to get teachers who are willing to teach privately. PrivatQ users are students. They can register to the PrivatQ platform and complete some of the information needed. Next, students can choose a teacher or tutor from the list available there. To DailySocial, the founder of PrivatQ told the initial idea of ​​the formation of PrivatQ since 3 years ago. At that time he was still a student. He felt that startups were able to change the order of the business model that had been used. Incidentally, the Ikhwan also works as a private teacher and sees opportunities in the private sector search service sector. Ikhwan, who at that time was a private instructor, saw that digital transformation like this could actually be applied and useful in many fields, including education. He wants to make technological innovations that simplify the process of ordering private education services with maximum results. He was also motivated to create PrivatQ because of his experience as a private instructor who encountered many obstacles - one of which was in the search for substitutes when he could not teach suddenly. As an online-based service, starting from the order to the payment process, PrivatQ's serious task is to maintain its quality. One of the influential factors is the quality of students as the ordering party, and the teacher who provides private teaching. In response to this, Ikhwan explained that there were four stages of selection that had to be taken to register as tutors. The first is CV selection, which can be done through email delivery. While the second step is interview and microteaching teaching simulation. The next two stages are collecting supporting files such as training conducted regularly to ensure the quality of tutors. After passing this stage, the tutor is declared active and has the right to be chosen by students. PrivatQ has the main features in the form of an online and real time system that is in accordance with the agreement between students and students. As a new service, PrivatQ will face business competition with other services to capture public interest. In response to this, Asep Suryana said: "As a technological innovation in education, PrivatQ sees competition with a spirit of openness. Competition will always be there, and that's what will bring the latest innovations to suit people's needs - such as in the PrivatQ planning process. " PrivatQ plans to work with schools and local governments to develop PrivatQ in the community. The hope is to disseminate the existence of PrivatQ, can help and facilitate the community in the teaching and learning process outside the classroom. This year, PrivatQ released a new version of the application. In PrivatQ 2.0, there are several additional features that make it easier for students to interact through the application. In the service menu for students, PrivatQ adds a menu of status updates, blog integration, and support for group learning features that can be carried out for up to 5 students. While in the teacher's menu, there is a reward feature given to appreciate the best teacher. Besides that, it also added bank questions and material support. To facilitate new users, now the registration process can be done via the web or application. 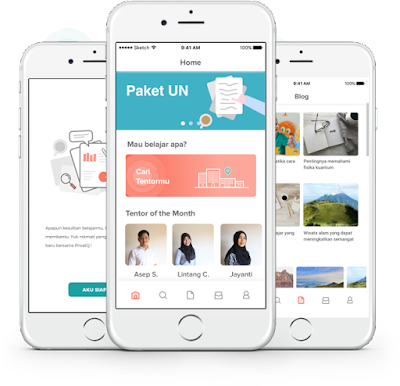 According to the CEO of PrivatQ, Ikhwan Catur Rahmawan, application updates are based on feedback obtained from users and research conducted by internal teams. Increasing application complexity, is also an important factor for the release of PrivatQ 2.0. PrivatQ 2.0 is present as an answer in response to the complexity of applications that continue to increase along with the development of users. The PrivatQ team strives for more practical and innovative applications. In business field, PrivatQ is also developing well. So far it has been able to accommodate the search needs of private tutors in 100 cities in Indonesia. Various strategic collaborations have also been established with partners. Ikhwan said: "PrivatQ emphasizes inclusiveness in services, so we accommodate both online and offline service schemes. In our opinion, there is an urgency to be able to harmonize learning media in accordance with the conditions of each region, especially in terms of geographical, socio-economic conditions, as well as supporting infrastructure and technology." Furthermore, Privat COO Asep Suryana said, currently his party is developing two new business models. The first is aimed at recurring revenue, the realization of which is in the form of learning package services and private learning groups. Then the second is the development of online classes with chat and multimedia features, expected to support the creation of interactive distance learning.